Singaporeans are no strangers to online shopping. The e-commerce industry has been flourishing, with online retailers becoming increasingly competitive. And one promising addition to the growing marketplace would be SingSale, an online shopping club that has become one of my most frequented sites. Essentially, it’s a members-only website which offers attractive deals on a variety of brands and products. Membership is free, which means everyone can sign up. When I say “variety”, I’m not kidding. Their offerings include not only apparel, footwear, bags, fragrances and makeup, but also toys and home essentials. The brands available depend on which category you are looking at, but they generally range from designer (Versace, Gucci, Guess, etc.) to the likes of Levi’s, Revlon and Nike. Other labels spotted include Lancome, Casio, Asics, Maybelline, Cotton On, Fossil and Timberland. 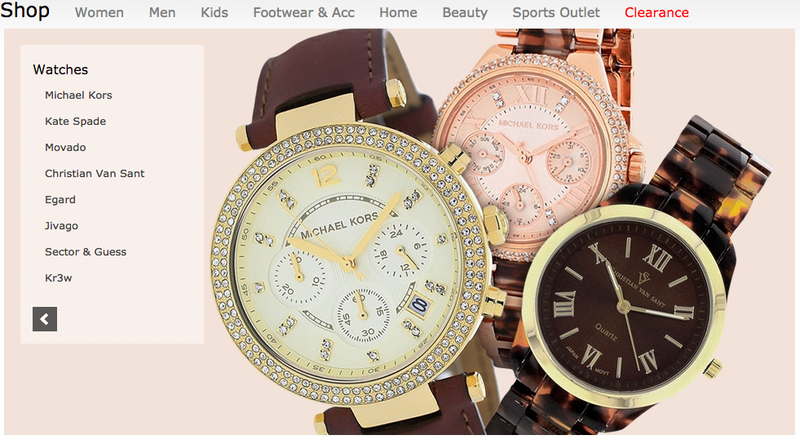 Watches from brands like Michael Kors. 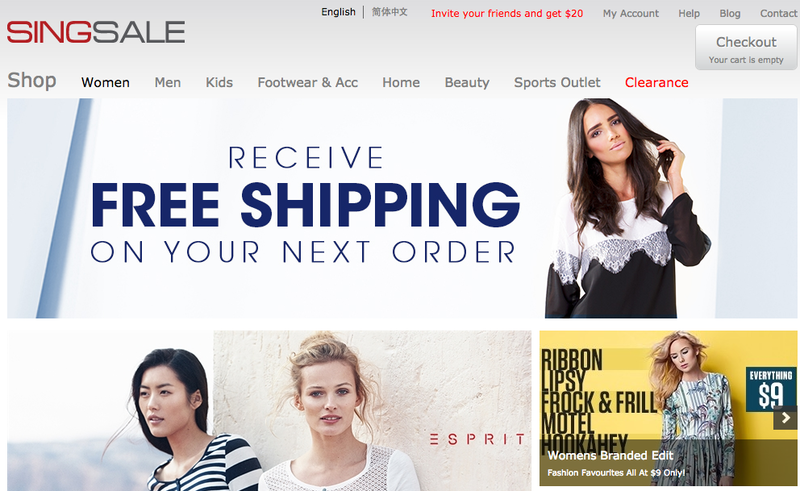 SingSale claims to offer discounts of up to 80% off recommended retail prices. This can be extremely worth it if you want the high-end lifestyle without the high prices, or simply want to snag yourself a good deal. And no, the goods are not cheaper because they’re knock-offs; the competitive prices are apparently the work of the company’s buyers, who source for partnerships and suppliers in Australia, US, Europe, New Zealand and other parts of Asia. Sales events are typically advertised for 1-3 days. However, items can run out of stock quickly, especially for the really popular brands. One example would be their sales event for Havaianas flip-flops, where certain designs were available only in a few sizes. Within a day, I noticed that size 37-38 for a particular design was already sold out. 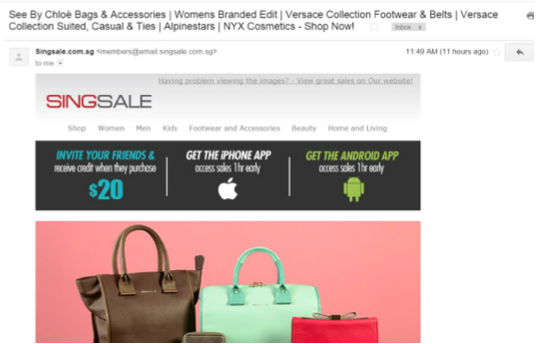 Members receive daily email notifications on new sales events that are starting. This can flood your inbox pretty quickly, but it’s great for keeping up with the brands being featured, especially if you don’t have the time or inclination to visit the site regularly to check if your favourite brand is having an offer. How a typical email from SingSale looks like. 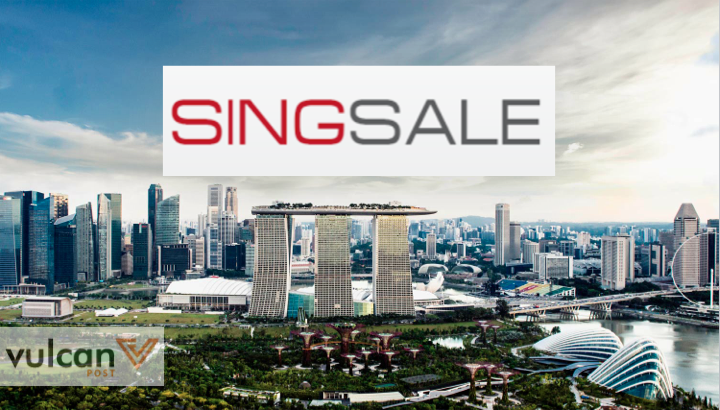 Once the sales event has ended, SingSale will then get their overseas partners to send the orders to their international warehouses (anywhere in USA, UK, Australia, New Zealand, China, Malaysia or Singapore). Orders are packed at the warehouses before being dispatched and sent directly to your doorstep. Customers may have to wait for a long time before receiving their items. SingSale claims that delivery time can take up to 28 days from the end of the sales event, “depending on where the goods are sourced from”. The estimated range of delivery dates will be shown on the product description page. In fact, a quick Google search will unearth reviews from several disgruntled customers. Some claim that customer service is unresponsive, while others assert that the items they received were damaged or different from what they had ordered. Despite these negative reviews, I decided to take the risk and go ahead with an order worth SGD19. Firstly, it was something I’d been eyeing for months, so I wasn’t in a rush to get my hands on it. 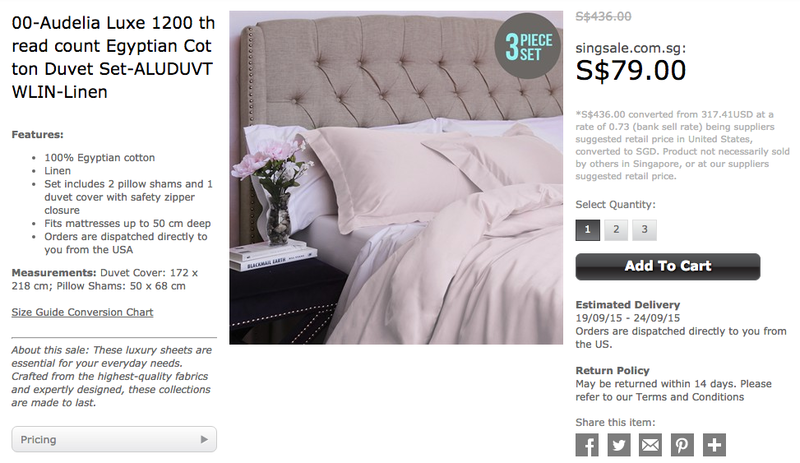 Secondly, it was at least 50% cheaper than if I were to purchase it directly from the outlets in Singapore. I was expecting my order to arrive in September, as you can see from the above screenshot. But on Thursday, 27 August, guess what arrived at my doorstep? Aside from the dented shoebox (which was fine because of the outer plastic envelope), my order was exactly as promised. I’m no expert but it did seem authentic as well. Note that my order came with free shipping, but other items may incur shipping costs. My personal experience with SingSale was pretty much a breeze; delivery time was relatively fast and the price was a great bargain. Of course, it helps if you do some research beforehand to check the usual retail price of your item. Have you tried SingSale before? Let us know how your experience was like!